Mobile Board needs the installation of Board Web Server. 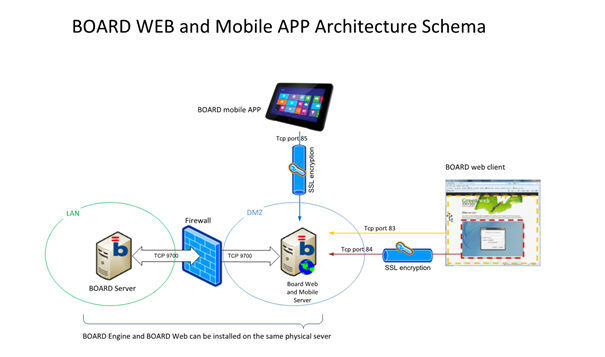 Board Web Server manages a dedicated proxy for all calls from mobile devices. The following diagram shows the communication ports used in a Board Mobile architecture. The default HTTP service port of Board Mobile proxy is 85, this port can be changes if desired. The Board Mobile proxy program communicates with the Board Server program through the standard port 9700 and receives from the Board Server all necessary data to produce the requested pages and actions. It’s possible to use a encrypt communications using a SSL Encryption. Board Mobile Client is compliant with Mobileiron the well known Platform of Mobile Application Management. Please visit Mobileiron Market Place for a full understanding of available features like Application Wrap-Up and Login Management.